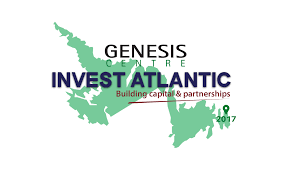 Invest Atlantic, which bills itself as East Coast Canada’s largest networking event for entrepreneurs and investors, hopped the Gulf of St. Lawrence for the first time this week and came to St. John’s. Having been held in Nova Scotia and New Brunswick for the past seven years, the two-day startup event was held in Newfoundland and Labrador on Tuesday and Wednesday with a theme of building networks. “This is your opportunity to create your own network – do not miss that opportunity,” local businessman and conference chair Paul Antle told the 270-strong audience, setting the tone for the conference. Get collaborative, the conference slogan urged. Get innovative. Get global. Dividers between adjoining conference rooms at the Sheraton Hotel encouraged this spirit of making partnerships, as did the back-to-back lineups at the luncheon buffets. Young entrepreneurs, including students, made up two-thirds of the crowd – the largest percentage ever at Invest Atlantic and one of the conference’s biggest successes, said conference organizer Bob Williamson. Among the entrepreneurs was 28-year-old Otito Atansi of Saint John, N.B., who arrived in Canada from Nigeria eight years ago. He recently co-founded Sankara Cuisine, a distribution service for ethnic food prepared by immigrant cooks. He was looking for advice on how to make the next move for his startup, which already delivers an average of 80 plates of food a day. The two days in which he participated were filled with workshops on a wide range of topics, from turning ideas into business models to partnering with the right kind of investors as the enterprise develops. The message from seasoned investors was clear: it’s the potential, not the immediate profit, that they’re interested in. As for manner of approach, they like confidence, prefer courtesy over pushiness, and are put off by pitches that are ill prepared. Still, the message throughout was a constant reminder that there is a support network in place. It sees entrepreneurs and investors as part of one ecosystem in which collaboration plays a key role. Attendance at the St. John’s edition of Invest Atlantic shows that this network is growing. When Invest Atlantic launched in Halifax seven years ago, it drew about 150 people, including seven investors with $12 million to invest, said the organizers. Attendance this year was 270, with 33 investors offering up to $250 million. Williamson agrees governments are getting better at doing their part but added nothing can replace the increasingly productive networking inside the entrepreneurial community itself. He said he knew of at least four deals made at the conference. What would a two-day business pow-wow be without some friendly competition? Ten entrepreneurs, all from Newfoundland, pitched their business ideas to juries of seasoned investors. Alex Robbins of Drone NL won the one-minute pitch for investment with a software application that would simplify the permit process for his drone service. He won a $5,000 cash prize. Emily Bland of Project Sucseed won the two-minute pitch with her presentation of a hydroponic unit that allows families to grow fresh produce in their own homes. She won $2,000 in cash and a market analysis of her project worth $40,000. Otito Atansi, the food services entrepreneur from New Brunswick, did not find his marketing specialist. But he admitted he learned a few important lessons. For example, he learned his food delivery service is not as unique as he had believed it to be. He realizes he needs to add something special to attract the interest he thinks his idea deserves and needs. Disclosure: Invest Atlantic is a client of Entrevestor.